GIMP has several selection tools to which you can use to isolate certain area before applying certain effects. One of the selection tools offered by GIMP is Scissors Select Tool. The way this tool works is roughly similar to Fuzzy Select Tool which select the area based on the color similarity. Scissors Select Tools is best suited to be used on an image which has a high contrast between the background and the object (the image you want to select). On that sort of image, this tool is capable of adapting itself to follow the shape of the object. Take a look at the screencast below to make it clearer. 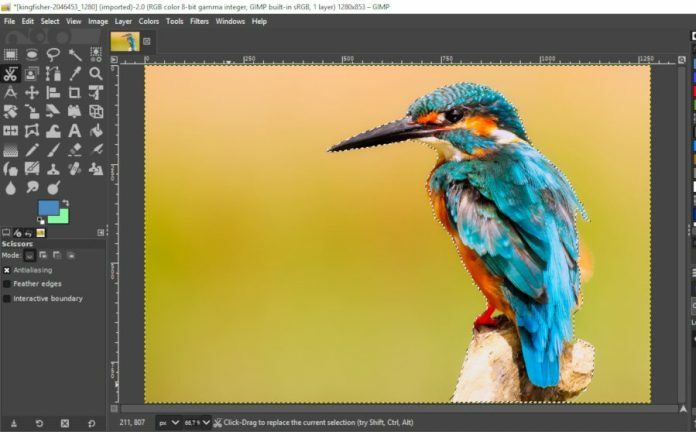 Scissors Select Tool is great to take apart an image that a solid background and blend it with another images for image manipulation. Unlike Fuzzy Select Tool which select the area on a single click, selection have to be done manually by clicking on spots according the object you want to select, much like Paths Tool. The more nodes you add (more clicks), the greater the accuracy of the tool. Antialiasing: Gently smooth the edges of the selection. Feather edges: Blurs the border to give you even softer edges. Interactive Boundary: Displays the path (line) when a control node is moved. Launch GIMP and open the image that has a solid background. Activate the Scissors Select Tool by clicking its icon on the Toolbox. Or, you can also use the shortcut by pressing I key on keyboard. Click on the edge of the subject as the starting point. Add control points along the outline. The line between the points is the ‘path’ of the selection. When the selection is complete, press the enter key on keyboard to apply the selection.